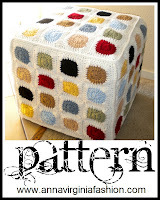 Here is a blog-post version of my Granny Square Ottoman Cover pattern. You may print a copy of this post. Click on a photo to enlarge. The pattern is also a free PDF via Ravelry. You will need the latest version of Adobe to open the PDF. Please do not sell or redistribute pattern as your own. If you have questions about this pattern or need help with a particular problem, let me know! I'm happy to answer any questions. You can leave a comment below or email me at shopannavirginia@gmail.com. Access FREE PDF here. I’ve been meaning to post about this for months, but it’s finally happening! I’m proud of how this turned out, and I think some of you out there might like to create a cover, too. 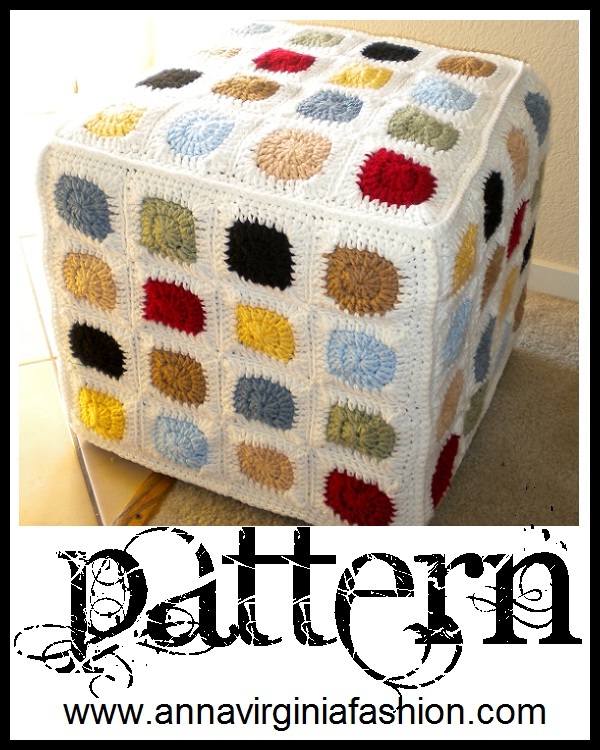 I found a couple of pictures online of crocheted ottoman covers, but there aren’t a whole lot. And less with patterns. In fact, I didn’t find any with a free pattern that was like this. So, I’ve prepared a pattern for your use. First, you will need to take measurements of the ottoman. For mine, I divided the measurements by four. This way I would get 4x4 squares on each side. Divide the dimensions of the ottoman by the number of squares that you would like (ei: my ottoman is 14 inches wide, so I divided that by 4 squares. Then I get 3.5 inch individual squares). This measurement is how big you'll want to crochet your squares. You’ll then want to figure how many colors you’d like to use. I had eight colors, and with 16 squares per side, that meant using the color twice on each side. Then, multiply the number of each color by 5 so that you get how many overall squares of each color. In my case, that was 2 (colors per side) by 5 (sides) meant that I needed 10 squares of each color for the entire ottoman. For each circle, use a Color. Rnd 3: In any st, attach new color and ch 3. In same st: (1 dc, 1 tr, 2 dc). *Dc in next 5 sts. In next st: (2 dc, 1 tr, 2 dc). Repeat from * 2 more times. Sl st to top of first ch. Fasten off. If this doesn’t add up to the size you need, then you may want to modify a bit. Add more rows to get a bigger square. If you need a smaller square, then do Rnd 3 in hdc or sc instead. Create as many squares as you calculated that you’ll need in each color. Sew each square to each other. I recommend sewing in long lines as follows: Attach squares together in a continuous line running vertically (ei: purple arrows below). Then close gaps by attaching squares in a continuous line in the horizontal direction (ei: green arrows below). I only stitched through back loops (second picture below) because it adds a little texture, but you can sew through both loops if you prefer. Complete square sewing each square arrangement for each side of the ottoman (5 sides). Attach White in a st on side of square. Sc around entire border, doing 3 sc in each corner (shown in second picture below). Next, attach each large square to another square to make a cube. I crocheted each portion together using sc. If you don’t want the ridges made by sc attachment, then you can sew the sides together. Start by attaching squares together by crocheting (or sewing) around in a continuous line following pink arrows in first image. This is done by arranging each of four large squares lining up a side around one large square. Then attach from each corner down the sides (blue arrows). Attach White to stitch to bottom of cube line. Sc crochet in each st around. Add extra rows if ottoman doesn’t quite reach the floor. Weave in loose ends. Pull on your ottoman and admire! Let me know if there are any mistakes or if anything needs to be clarified. I’d also love to see your finished projects! If you used and appreciated this or any other free pattern on my site, please consider donating (link above right) or purchasing via my Ravelry Shop. Thanks! This pattern is licensed for personal use only. No item made using this pattern may be sold. I drop by! Thanks for link! Found you via Tangled Happy. This is so cool, thanks so much for sharing your pattern. Is it okay if I Pin it to my Crochet Board on Pinterest? Thanks. Thanks for stopping by! I would love for you to pin in on Pinterest. I tried to add a Pin it button to my pictures throughout the blog, but they kept ending up covering the picture (not where I wanted the button!)! Very beautiful, thanks for sharing! Thanks so much for sharing, I don't have an ottoman to cover, but am using this pattern to make an ottoman.🤣 Just making an extra square and stuffing it. I love your plan! I'd love to see photos when it's done!